Every musician needs an easy to reach place for their stuff. The Gator Frameworks Line now offers an extra-large solution with the addition of the GFW-MICACCTRAYXL. 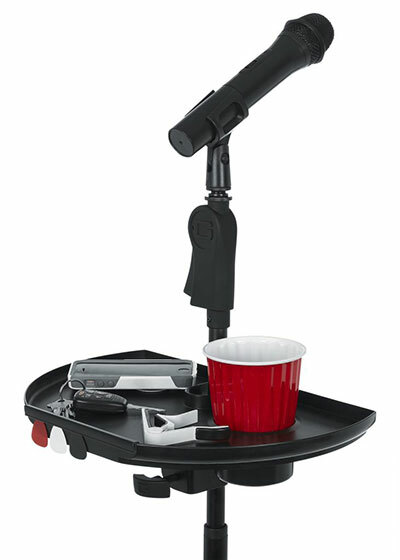 This convenient tray can attach to most microphone stands, music stands and drum hardware up to 1.38” (35mm) in diameter. The large 14” x 9” surface is perfect for storing your phone, keys, harmonica, capo, slides and other favourite accessories you need close at hand. Keep an assortment or set of emergency picks at your fingertips with the included pick holder which holds up to 5 picks. Stay hydrated between sets and keep your drink safe from being kicked or knocked over by utilising the recessed drink holder. Get the GFW-MIC-ACCTRAY and the new GFW-MICACCTRAYXL from authorised Gator Frameworks dealers. Check out the entire line of Gator Frameworks stands for microphones, speakers, pro-audio/video, guitar, keyboard and more on-line now.